A couple of weeks ago, the documentary Dominion was shown for the first time to a public audience in Belgium. 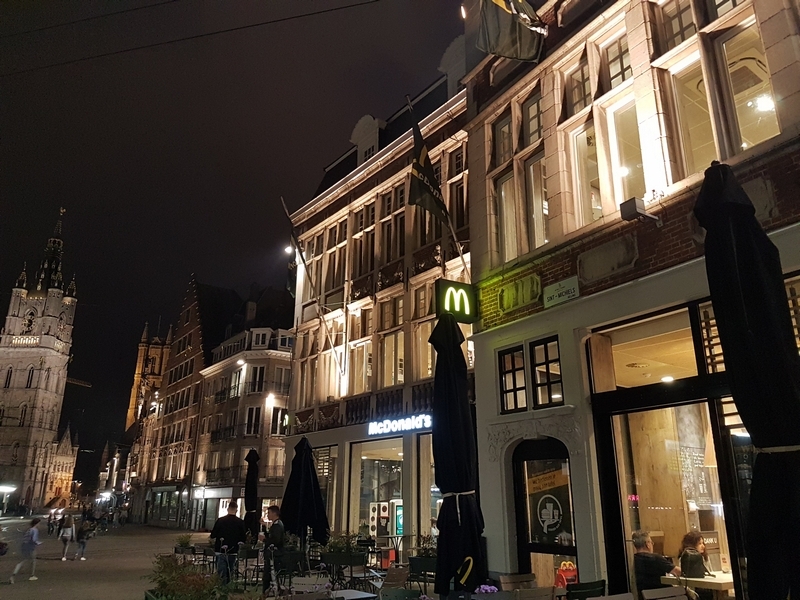 The premiere was in the Sphinx cinema, in the heart of the city of Ghent (next to the McDonalds, oh the irony). The screening was organised by the ‘Dominion Movement Belgium’. I had already seen the announcement of the premiere surface a couple of times on social media, but I was in doubt for a long time whether I would attend. Very mixed feelings. 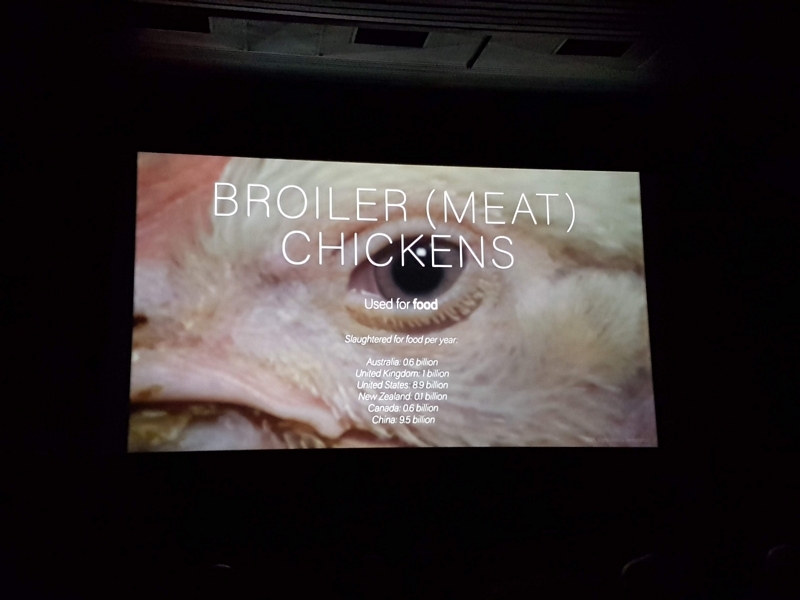 I felt the theater should be filled with non-vegans, because they are precisely the ones who should be made aware of the injustice inflicted upon other animals. If I were to go, I would have preferred to take non-vegan friends with me. But as I did not have my own means of transportation that evening, it was more difficult for me to invite friends to come along. I was also anxious about being able to cope emotionally with the footage. In the more than twenty years of exploring all sorts of issues related to animal rights and speciesism, I have seen a lot of footage depicting the horrible fate of animals at the hands of humans. I have also read a lot about these issues, and I know the gruwesome destiny of animals all too well unfortunately. That also inspired me to become vegan. Growing older, I find it increasingly difficult to cope psychologically with such explicit footage. When Earthlings came out (2005) I could not manage to watch for more than a few minutes. But I wanted to know whether Dominion is a documentary that I would recommened to others (and to what audience and under what circumstances), and as such, it is a prerequisite that I have seen it myself. Going by the trailer (see below) the footage seemed to include a lot of images from the living environments of the animals and their surroundings, a lot taken form a distance made with drones. So I decided to go to the premiere afterall. 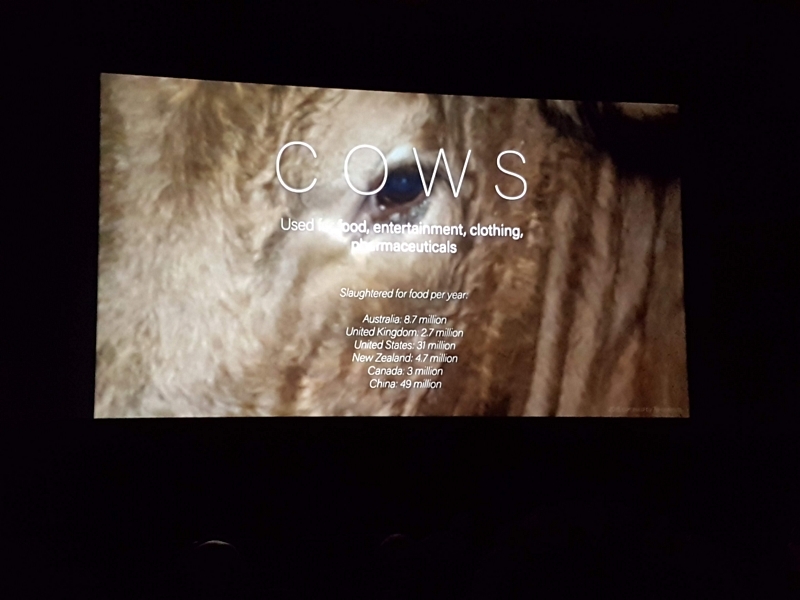 Before the documentary, some prerecorded messages from proponents of local organisations were shown (Benjamin Loison from Bite Back, Peter Verhaegen from Dier Animal and Benoit van den Broeck from Animal Rights) and from famous animal activists James Aspey & Joey ‘Carbstrong’, with a call to be active for the animals. After which the documentary immediately started. Divided into sections according to animals species, an enumeration with facts of their existence was given: (articifial) insemination, their birth, their living conditions, to being killed. From chickens to sheep, from pigs to cows, from dolphins to goats, the footage and text extensively documented how and why they are being used, and how their miserable lives come to an end. Each section introduced by a short ‘fact sheet’ with some statistics, with a backdrop of a close up of that respective animal species (see photos). The footage was really tough. Fifteen minutes into the documentary, I was already quite beaten down. The atrocities to which humans are capable of is limitless. Shredded baby chicks, slowly starving animals in cramped hangars. The fear in the animals’ eyes. The screaming. The blood. The sequence of images from the farming industry, the fisheries, horse racing and other domains in which animals are used went on for about two hours. It hit really hard. At times, there was a tear running down my face, and around me, I heard some suppressed sobs. The footage was accompanied by serene spoken words by Joaquin Phoenix (among others), and peaceful quiet music. The enumeration of the situation of the respective animal species, was followed by a short general round up, and some tips on what one can do to stop this. 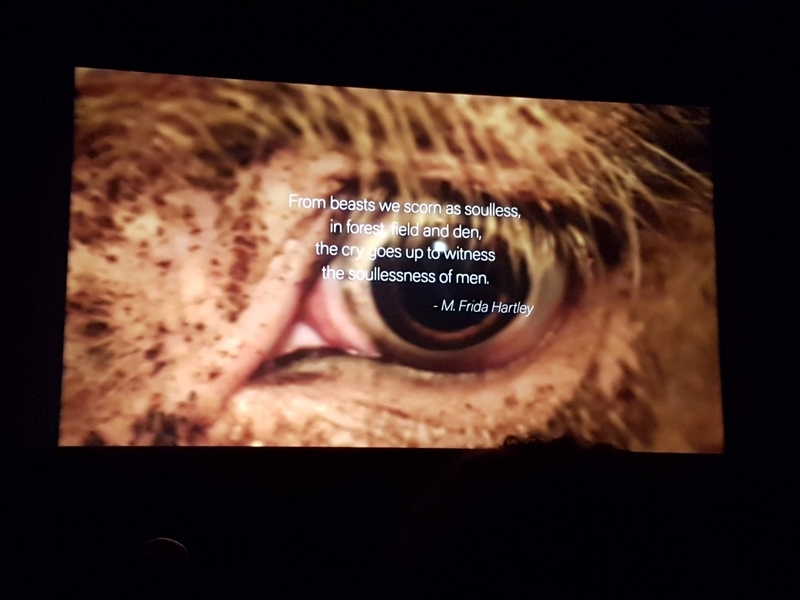 I tried to give my sadness a place – also in the days after the screening – by this quote that is quite well known among animal activists: The sadness I feel looking into cages, is nothing compared to what it must feel like looking out. Of course that is undeniably the case, but the possible traumatic impact of watching such footage on humans may also not be dismissed or discounted. After the premiere, I read some discussions on social media about whether one ‘must’ have seen such footage. Contrary to some who claim that vegans must have seen these images, I do not think that vegans or animal activists are obliged to expose themselves to watching such explicit footage. And I fully understand that for a lot of people – who furthermore already know about these atrocities – this is too confrontational or even traumatising (1). Not being able or not wanting to watch this documentary or such footage does not make one a bad vegan or a lesser activist. Some people are informed through other ways, e.g. by reading about it, by attending lectures. I do not have to see images of the torture of prisoners of war, or the execution of the death penalty, to realise the horror and be opposed to it. 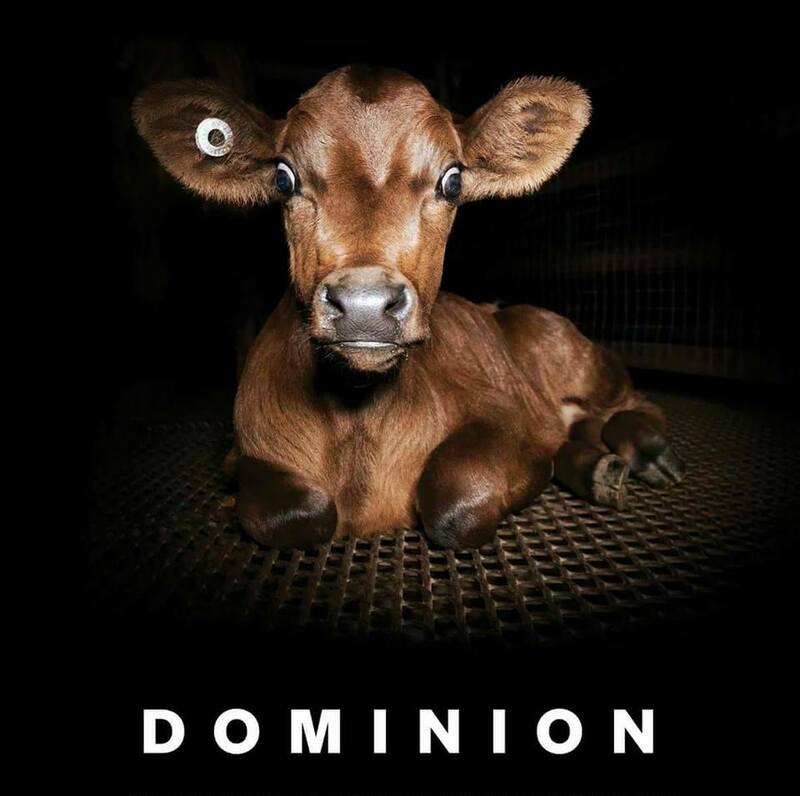 Such footage – and also this documentary Dominion – is undoubtedly strong campaign material and has an important place in animal activism. 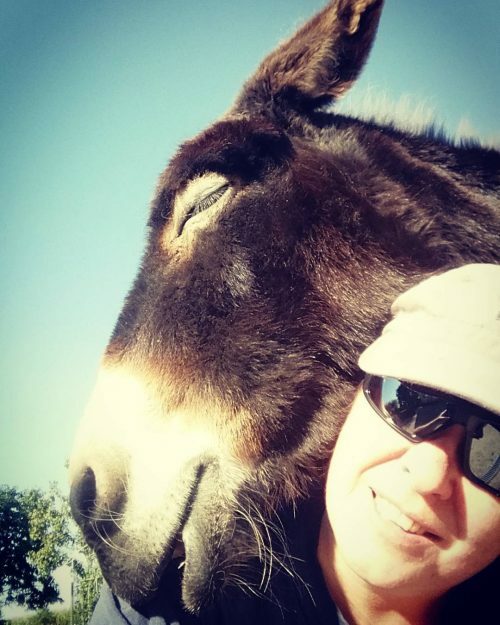 Next to this, some people will be more open to change their thoughts and behaviour because of information that stresses the emotional lives of animals, or footage or books centering the personality of animals, that they are living sentient beings, who can feel pain, and have emotions (the movie Babe being just one example). And will become aware of animal rights issues in that way. With respect to the possible traumatic impact, there are some tips for ‘self care’ mentioned on the webitse of Dominion. The leaflet handed out prior to the screening in Ghent, also lists some recommendations on how to deal with these feelings (although I only discovered that days after seeing the docu). The documentary mainly consisted of information on the treatment of the respective animal species, with footage to go along with that. The general framework (how did it come to this? what next? what can one do?) at the end was very brief. I would have liked to see it more balanced, with more explanation about the ideologies that support this exploitation, and framed more extensively within the context of the socio-economic system. In this last section, there was a brief reference to the link between the oppression of other animals and other forms of exploitation, racism, sexism and the holocaust, with very explicit footage of the oppression of those groups. There is undeniably a connection between these different ‘ism’s’ (2) but it was brought on the forefront very superficially and as such came across as a casual reference. This has proven to be potentially offensive and hurtful for people of those oppressive groups being framed in that way. And as such also can have an adversary effect to raising awareness about animal rights and veganism (3). Bringing such parallels to the forefront requires much more contextualising than a gratuitous and casual reference in one minute. And as this also makes a link with pro-intersectionality and inclusiviness, the one-sided ‘profile’ of the introductory speakers was a pity. (nothing personal guys, but it was striking). I would have loved to hear what woman activists have to say about this docu. How vegans of colour experience it. If we want to reach a divers audience (and that is necessary, since we are living in a diverse society, and being a movement that centers justice and equality) if we want to be an inclusive movement, it is necessary to also let the voices of those oppressed groups be heard and put more on the forefront. When using such footage in animal rights activism, the danger creeps in that the narrative becomes predominantly focused on the abuse (the treatment) of the animals concerned (which could then be solved with better treatment – a reply that is the standard response from a welfarist perspective, and from the industry itself). Animal rights is about respect for the animals, the end of the use of animals full stop. Whether they are killed with or without stunning, whether they are castrated with or without anesthesia, whether they are locked up in a small or large cage, is irrelevant from an animal rights perspective. Whether they are packed together with 50.000 in a hangar or living together with 10 siblings in a barn, whether they are killed as a juvenile, or at old age. The heart of the matter is thàt they are being used, and thàt they are being killed. This was also touched upon at the end of the documentary, although I would have liked to seen this stressed more and elaborated further. After the screening, I had a chat with some of the other attendants. The most inspiring news came from an activist who had brought along six non-vegan family members! It was also nice to meet some people in real life, who I had previously only talked to online. Despite it being really hard to watch the footage, I am ‘happy’ that I have seen Dominion (‘happy’ is of course an ironic choice of words, it certainly is not a documentary which leaves one cheerful). It is a very powerful documentary, and hopefully will plant lots of seeds of awareness regarding animal rights. Although the first step is of course to get people to watch the documentary in the first place. (2) See e.g. Patterson C. (2002) Our treatment of Animals and the Holocaust; M. Spiegel (1998) The Dreaded Comparison. Human and Animal Slavery; Nibert (2002) Animal Rights, Human Rights Entanglements of Oppression and Liberation and work of ecofeminists like Carol Adams (e.g. The Sexual Politics of Meat, 1992). (3) See e.g. C.S. McJetters (2017) The Prop of Black People in White Self-Perceptions: Revisiting the Slavery Comparison, Guest blog on Sistah Vegan, blog from Breeze Harper. The title of this blogpost is inspired by a quote from Franz Kafka. ‘Now I can look at you in peace. I don’t eat you anymore‘. Which he supposedly said after going vegetarian, and watching fish in an aquarium. Realising that I – being vegan – do my best not to contribute to the exploitation of animals, does bring some ‘inner peace’, but it is still darn hard to – realising what humanity does to animals – look animals straight in the eye. Deze blogpost staat ook in het Nederlands op mijn andere blog Graswortels. Kan ik je nu met een gerust geweten bekijken? 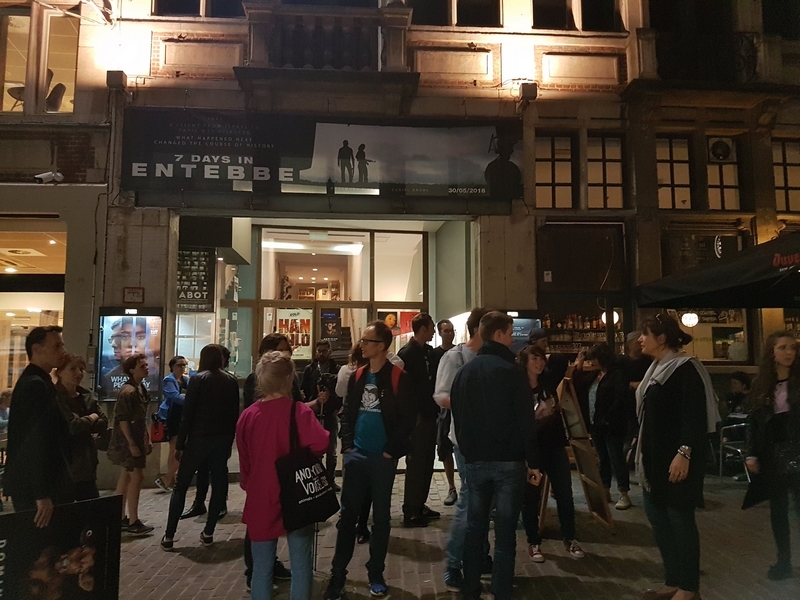 Première Dominion, Gent.